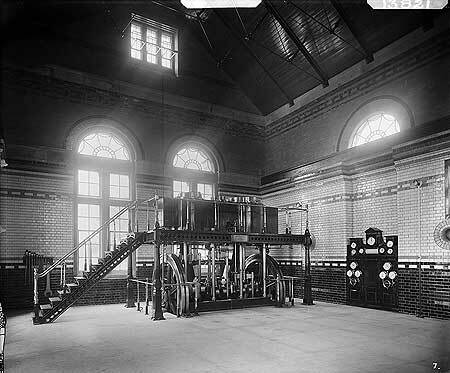 Interior view of the Pumping House at Swithland Water Works, showing part of the pump machinery. The building is part of a complex of structures at the site, completed in 1896 to the designs of architects J B Everard and Everard and Pick. The photograph was commissioned by Everard and Pick. The pump machinery was made by Easton, Anderson and Coolden Limited, Engineers, of London and Erith, and is dated 1895.